We at the NewsGallery are esctatic to hear that ther will be a TEDWomen launch: a new subgroup of Ted conferences that will solely focus on women leading the world! 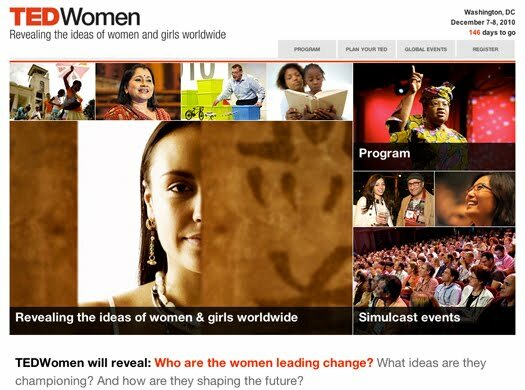 Because even in a platform that stands for "Ideas Worth Spreading,"as far as pushing change and innovation to a more progressive path for the human condition, as of yet: there has never been enough women to represent the full scale of humankind equally--even on TED, the number of women speakers is sadly reflective of the real world as well. No matter how positive "reports" may appear about reaching a new high representation in the workplace, when you break down the statistics as to how much women are paid versus men, and how much women remain drastically under-represented in positions of power, and how women are still being abused all over the world ordained by law, a lot of the ubiquitous rhetoric out there is simply deceiving--there is still much work to be done, and there will be for quite some time--and THAT: is definitely an idea worth spreading in the NewsGallery book. The first TEDWomen will launch in December 7-8 in Washington, DC. Over the last several years, our ideas about women have changed. Investing in women and girls was once seen as a radical notion; today, its value is clear. A new lens reveals women as powerful change agents: In developing nations, women and girls hold the vital link to economic growth, public health, political stability. In the West, generations of educated women are forging new directions in the sciences, arts, business and beyond. To track this emerging story, the first-ever TEDWomen will explore in depth: Who are the women who leading change? What ideas are they championing? How are they shaping the future? TEDWomen will also reveal how women and men, in concert with one another, orchestrate different but complementary approaches to ideas worth spreading. The cross-disciplinary, cross-generational program will focus on how women think and work, communicate and collaborate, learn and lead—what this means and why it matters to all of us. Speakers from around the globe—from anthropologists to artists, scientists to soldiers, bankers to builders, farmers to futurists—will share their ideas in the world-renowned TED format, creating a program that surprises and inspires.